For other uses, see Cake (disambiguation). "Cake slice" redirects here. For the item of cutlery, see Cake and pie server. Cake is a form of sweet dessert that is typically baked. In their oldest forms, cakes were modifications of breads, but cakes now cover a wide range of preparations that can be simple or elaborate, and that share features with other desserts such as pastries, meringues, custards, and pies. Typical cake ingredients are flour, sugar, eggs, butter or oil or margarine, a liquid, and leavening agents, such as baking soda or baking powder. Common additional ingredients and flavourings include dried, candied, or fresh fruit, nuts, cocoa, and extracts such as vanilla, with numerous substitutions for the primary ingredients. Cakes can also be filled with fruit preserves, nuts or dessert sauces (like pastry cream), iced with buttercream or other icings, and decorated with marzipan, piped borders, or candied fruit. Cake is often served as a celebratory dish on ceremonial occasions, such as weddings, anniversaries, and birthdays. There are countless cake recipes; some are bread-like, some are rich and elaborate, and many are centuries old. Cake making is no longer a complicated procedure; while at one time considerable labor went into cake making (particularly the whisking of egg foams), baking equipment and directions have been simplified so that even the most amateur of cooks may bake a cake. The term "cake" has a long history. The word itself is of Viking origin, from the Old Norse word "kaka". The ancient Greeks called cake πλακοῦς (plakous), which was derived from the word for "flat", πλακόεις (plakoeis). It was baked using flour mixed with eggs, milk, nuts and honey. They also had a cake called "satura", which was a flat heavy cake. During the Roman period, the name for cake became "placenta" which was derived from the Greek term. A placenta was baked on a pastry base or inside a pastry case. The Greeks invented beer as a leavener, frying fritters in olive oil, and cheesecakes using goat's milk. In ancient Rome, basic bread dough was sometimes enriched with butter, eggs, and honey, which produced a sweet and cake-like baked good. Latin poet Ovid refers his and his brother's birthday party and cake in his first book of exile, Tristia. Early cakes in England were also essentially bread: the most obvious differences between a "cake" and "bread" were the round, flat shape of the cakes, and the cooking method, which turned cakes over once while cooking, while bread was left upright throughout the baking process. Sponge cakes, leavened with beaten eggs, originated during the Renaissance, possibly in Spain. During the Great Depression, there was a surplus of molasses and the need to provide easily made food to millions of economically depressed people in the United States. One company patented a cake-bread mix in order to deal with this economic situation, and thereby established the first line of cake in a box. In so doing, cake as it is known today became a mass-produced good rather than a home- or bakery-made specialty. Later, during the post-war boom, other American companies (notably General Mills) developed this idea further, marketing cake mix on the principle of convenience, especially to housewives. When sales dropped heavily in the 1950s, marketers discovered that baking cakes, once a task at which housewives could exercise skill and creativity, had become dispiriting. This was a period in American ideological history when women, retired from the war-time labor force, were confined to the domestic sphere, while still exposed to the blossoming consumerism in the US. This inspired psychologist Ernest Dichter to find a solution to the cake mix problem in frosting. Since making the cake was so simple, housewives and other in-home cake makers could expend their creative energy on cake decorating inspired by, among other things, photographs in magazines of elaborately decorated cakes. Ever since, cake in a box has become a staple of supermarkets, and is complemented with frosting in a can. Cakes are broadly divided into several categories, based primarily on ingredients and mixing techniques. Although clear examples of the difference between cake and bread are easy to find, the precise classification has always been elusive. For example, banana bread may be properly considered either a quick bread or a cake. Butter cakes are made from creamed butter, sugar, eggs, and flour. They rely on the combination of butter and sugar beaten for an extended time to incorporate air into the batter. A classic pound cake is made with a pound each of butter, sugar, eggs, and flour. Baking powder is in many butter cakes, such as Victoria sponge. The ingredients are sometimes mixed without creaming the butter, using recipes for simple and quick cakes. Sponge cakes (or foam cakes) are made from whipped eggs, sugar, and flour. They rely primarily on trapped air in a protein matrix (generally of beaten eggs) to provide leavening, sometimes with a bit of baking powder or other chemical leaven added as insurance. Sponge cakes are thought to be the oldest cakes made without yeast. An angel food cake is a white sponge cake that uses only the whites of the eggs and is traditionally baked in a tube pan. The French Génoise is a sponge cake that includes clarified butter. Highly decorated sponge cakes with lavish toppings are sometimes called gateau, the French word for cake. Chiffon cakes are sponge cakes with vegetable oil, which adds moistness. 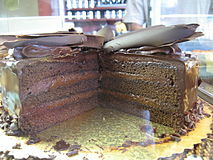 Chocolate cakes are butter cakes, sponge cakes, or other cakes flavored with melted chocolate or cocoa powder. German chocolate cake is a variety of chocolate cake. Fudge cakes are chocolate cakes that contains fudge. Coffee cake is generally thought of as a cake to serve with coffee or tea at breakfast or at a coffee break. Some types use yeast as a leavening agent while others use baking soda or baking powder. These cakes often have a crumb topping called streusel or a light glaze drizzle. Baked flourless cakes include baked cheesecakes and flourless chocolate cakes. Cheesecakes, despite their name, aren't really cakes at all. Cheesecakes are in fact custard pies, with a filling made mostly of some form of cheese (often cream cheese, mascarpone, ricotta, or the like), and have very little flour added, although a flour-based or graham cracker crust may be used. Cheesecakes are also very old, with evidence of honey-sweetened cakes dating back to ancient Greece. Butter or oil layer cakes include most of the traditional cakes used as birthday cakes, etc., and those sold as packaged cakes. Baking powder or bicarbonate of soda are used to provide both lift and a moist texture. Many flavorings and ingredients may be added; examples include devil's food cake, carrot cake, and banana bread. Yeast cakes are the oldest and are very similar to yeast breads. Such cakes are often very traditional in form, and include such pastries as babka and stollen. 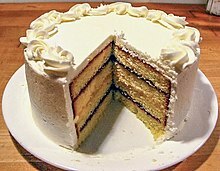 Some varieties of cake are widely available in the form of cake mixes, wherein some of the ingredients (usually flour, sugar, flavoring, baking powder, and sometimes some form of fat) are premixed, and the cook needs add only a few extra ingredients, usually eggs, water, and sometimes vegetable oil or butter. While the diversity of represented styles is limited, cake mixes do provide an easy and readily available homemade option for cooks who are not accomplished bakers. Chocolate Cake pops with sprinkles. A cake pop is a cake styled as a lollipop. 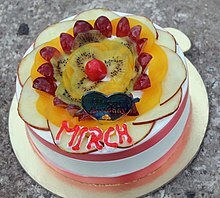 Cakes may be classified according to the occasion for which they are intended. 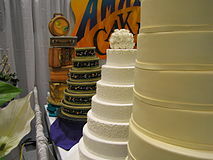 For example, wedding cakes, birthday cakes, cakes for first communion, Christmas cakes, Halloween cakes, and Passover plava (a type of sponge cake sometimes made with matzo meal) are all identified primarily according to the celebration they are intended to accompany. The cutting of a wedding cake constitutes a social ceremony in some cultures. The Ancient Roman marriage ritual of confarreatio originated in the sharing of a cake. Particular types of cake may be associated with particular festivals, such as stollen or chocolate log (at Christmas), babka and simnel cake (at Easter), or mooncake. There has been a long tradition of decorating an iced cake at Christmas time; other cakes associated with Christmas include chocolate log and mince pies. A Lancashire Courting Cake is a fruit-filled cake baked by a fiancée for her betrothed. The cake has been described as "somewhere between a firm sponge – with a greater proportion of flour to fat and eggs than a Victoria sponge cake – and a shortbread base and was proof of the bride-to-be's baking skills". 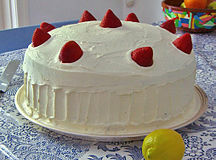 Traditionally it is a two-layer cake filled and topped with strawberries or raspberries and whipped cream. Dobos torte is an older form of layer cake. Special cake flour with a high starch-to-gluten ratio is made from fine-textured, soft, low-protein wheat. It is strongly bleached, and compared to all-purpose flour, cake flour tends to result in cakes with a lighter, less dense texture. Therefore, it is frequently specified or preferred in cakes meant to be soft, light, and/or bright white, such as angel food cake. However, if cake flour is called for, a substitute can be made by replacing a small percentage of all-purpose flour with cornstarch or removing two tablespoons from each cup of all-purpose flour. Some recipes explicitly specify or permit all-purpose flour, notably where a firmer or denser cake texture is desired. A cake can fall, whereby parts of it sink or flatten, when baked at a temperature that is too low or too hot, when it has been underbaked and when placed in an oven that is too hot at the beginning of the baking process. The use of excessive amounts of sugar, flour, fat or leavening can also cause a cake to fall. A cake can also fall when subjected to cool air that enters an oven when the oven door is opened during the cooking process. 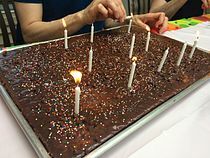 A finished cake is often enhanced by covering it with icing, or frosting, and toppings such as sprinkles, which are also known as "jimmies" in certain parts of the United States and "hundreds and thousands" in the United Kingdom. Frosting is usually made from powdered (icing) sugar, sometimes a fat of some sort, milk or cream, and often flavorings such as vanilla extract or cocoa powder. Some decorators use a rolled fondant icing. Commercial bakeries tend to use lard for the fat, and often whip the lard to introduce air bubbles. This makes the icing light and spreadable. Home bakers either use lard, butter, margarine, or some combination thereof. Sprinkles are small firm pieces of sugar and oils that are colored with food coloring. In the late 20th century, new cake decorating products became available to the public. These include several specialized sprinkles and even methods to print pictures and transfer the image onto a cake. Special tools are needed for more complex cake decorating, such as piping bags and various piping tips, syringes and embossing mats. To use a piping bag or syringe, a piping tip is attached to the bag or syringe using a coupler. The bag or syringe is partially filled with icing which is sometimes colored. Using different piping tips and various techniques, a cake decorator can make many different designs. Basic decorating tips include open star, closed star, basketweave, round, drop flower, leaf, multi, petal, and specialty tips. An embossing mat is used to create embossed effects. A cake turntable that cakes are spun upon may be used in cake decoration. Royal icing, marzipan (or a less sweet version, known as almond paste), fondant icing (also known as sugarpaste), and buttercream are used as covering icings and to create decorations. Floral sugarcraft or wired sugar flowers are an important part of cake decoration. Cakes for special occasions, such as wedding cakes, are traditionally rich fruit cakes or occasionally Madeira cakes, that are covered with marzipan and iced using royal icing or sugar-paste. They are finished with piped borders (made with royal icing) and adorned with a piped message, wired sugar flowers, hand-formed fondant flowers, marzipan fruit, piped flowers, or crystallized fruits or flowers such as grapes or violets. Birthday cake with a variety of toppings. ^ Cake finishes. YouTube. Retrieved 23 December 2011. ^ The history of cakes. Devlaming.co.za. Retrieved 23 December 2011. ^ Castella, Krystina (2010). A World of Cake: 150 Recipes for Sweet Traditions From Cultures Around the World, pp. 3–4. ISBN 978-1-60342-576-6. ^ a b c Ayto, John (2002). An A–Z of food and drink. Oxford [Oxfordshire]: Oxford University Press. ISBN 0-19-280352-2. ^ Ov. Tris. IV. X:12. ^ Castella, Krystina (2010). A World of Cake: 150 Recipes for Sweet Traditions From Cultures Around the World, pp. 6–7. ISBN 978-1-60342-576-6. ^ Park, Michael (2013). "A History of the Cake Mix, the Invention That Redefined 'Baking'". bonappetit.com. Bon Appétit. ^ Catalano, Christina (2002). "Shaping the American Woman: Feminism and Advertising in the 1950s". Constructing the Past. 3 (1): 45. Retrieved 25 May 2014. ^ "Something Eggstra". Snopes.com. Retrieved 25 May 2014. ^ Robbins, Mary Jane. "Creaming butter and sugar". King Arthur Flour. Retrieved 6 December 2015. ^ Cloake, Felicity (16 May 2013). "How to make the perfect Victoria sponge cake". Guardian. Retrieved 6 December 2015. [Victoria sponge] is a misnomer, because a true sponge, of the kind used in Swiss rolls, is made from a whisked mixture of eggs, sugar and flour. ^ Medrich, Alice (1997). Joy of Cooking. New York: Scribner. p. 949. ISBN 0-684-81870-1. ^ Berry, Mary. "Chocolate sponge cake". Food: Recipes. BBC. Retrieved 6 December 2015. ^ 1 June 2011. "The history of the Courting Cake, a Lancashire tradition". Lancashire Life. Retrieved 9 October 2015. ^ Types of Flour. Whatscookingamerica.net. Retrieved 23 December 2011. ^ Cake flour properties and substitutions. Gourmetsleuth.com. Retrieved 23 December 2011. ^ What is cake flour?. ninemsn.com.au (1 August 2007). Retrieved 23 December 2011. ^ Irma von Starkloff Rombauer; Marion Rombauer Becker (1975). Joy of cooking. Simon and Schuster. pp. 547–. ISBN 978-0-02-604570-4. ^ Science and Industry. Colliery engineer Company. 1899. p. 174. ^ a b Eicher, L.; Williams, K. (2009). The Amish Cook's Baking Book. Andrews McMeel Publishing. p. 118. ISBN 978-0-7407-8547-4. ^ a b Gelb, A.; Levine, K. (2005). A Survival Guide for Culinary Professionals. Thomson Delmar Learning. p. 243. ISBN 978-1-4018-4092-1. ^ Bureau of Medicine And Surgery, United States. Navy Dept (1944). "Fallen+cake" The Hospital Corps Quarterly: Supplement to the United States Naval Medical Bulletin. p. 128. ^ Eckhardt, L.W. ; Baigrie, J. (2005). Cakes from Scratch in Half the Time. Chronicle Books. p. 23. ISBN 978-0-8118-4240-2.